Geography portion is the most essential part and covers most of the syllabus for the IAS Prelims Exam. So, Geography should be prepared from standard sources. Here, we are providing some questions from standard books. entation of geography is mostly scientific and hence only the candidates having comprehensive understanding of the subject can answer all the questions of geography for the IAS Prelims Exam. Geography is so vast in its syllabus that it covers most section of the General Studies for the IAS Prelims Exam. The candidates cannot overlook the geography portion because there are various aspects of geography which can be of significant help in the overall General Studies Preparations. So, it’s advisable to prepare geography from standard sources starting with NCERTS. Q1. Seismology helps us understand the origin and intensity of earth’s interior. Consider the following statements regarding Seismic waves? 1. All seismic waves are mechanical waves and require medium to propagate. Seismic waves are waves of energy that travel through the Earth's layers, and are a result of earthquakes, volcanic eruptions, magma movement, large landslides and large man-made explosions that give out low-frequency acoustic energy. Seismic wave fields are recorded by a seismometer, hydrophone (in water), or accelerometer. The propagation velocity of the waves depends on density and elasticity of the medium. Velocity tends to increase with depth and ranges from approximately 2 to 8 km/s in the Earth's crust, up to 13 km/s in the deep mantle. The refraction or reflection of seismic waves is used for research into the structure of the Earth's interior, and man-made vibrations are often generated to investigate shallow, subsurface structures. Q2. Which of the following seismic waves is correctly matched with its respective property? 1. Secondary Waveà surface seismic waves that cause horizontal shifting of the Earth during an earthquake. 2. Love Waveà can pass through all the mediums. d) All are correctly matched. Secondary waves (S-waves) are shear waves that are transverse in nature. S-waves can travel only through solids, as fluids (liquids and gases) do not support shear stresses. S-waves are slower than P-waves, and speeds are typically around 60% of that of P-waves in any given material. Love waves are surface seismic waves that cause horizontal shifting of the Earth during an earthquake. They form a distinct class, different from other types of seismic waves, such as P-waves and S-waves (both body waves), or Rayleigh waves (another type of surface wave). Love waves travel with a lower velocity than P- or S- waves, but faster than Rayleigh waves. Rayleigh waves are part of the seismic waves that are produced on the Earth by earthquakes. They are a type of surface acoustic wave that travel on solids. They can be produced in materials in many ways, such as by a localized impact or by piezo-electric transduction, and are frequently used in non-destructive testing for detecting defects. Inner Core is the densest layer of earth’s interior. Continental crust is less dense than the oceanic crust. The Crust is the outermost solid part of the earth. It is brittle in nature. The thickness of the crust varies under the oceanic and continental areas. Oceanic crust is thinner as compared to the continental crust. The oceanic crust is basalt and the mean density of material in oceanic crust is 2.7 g/cm3. The outer core is in liquid state while the inner core is in solid state. At the centre of the earth at 6,300 km, the density value is around 13g/cm3. The core is made up of very heavy material mostly constituted by nickel and iron. It is sometimes referred to as the nife layer. Gravitation force is not same at different latitudes on the surface. Gravitational force is greater near the poles and less at the equator. Gravity anomalies give us information about the distribution of mass of the material in the crust of the earth. The gravity values differ according to the mass of material. The uneven distribution of mass of material within the earth influences this value. The reading of the gravity at different places differs from the expected values. Such a difference is called gravity anomaly. The gravitation force is not the same at different latitudes on the surface. It is greater near the poles and less at the equator. This is because of the distance from the centre at the equator being greater than that at the poles. Q5.which of the following statements is correct regarding the composition of interior of the Earth? a) Earth as a whole is composed of mainly iron (Fe) but the earth’s crust consists of mostly oxygen. b) The temperature and pressure increase with the increasing distance from the surface towards the interior in deeper depths. c) Continental crust is thicker than oceanic crust. Earth’s elemental composition reflects mostly heavier elements not blown away by solar wind during formation of the solar system. Most abundant elements are Fe, O, Si, Mg and most common minerals consist of silica (SiO2 ) mixed in varying proportions with other elements such as Fe, Mg, Al, Ca, K, Na. The thickness of the crust varies under the oceanic and continental areas. Oceanic crust is thinner as compared to the continental crust. The mean thickness of oceanic crust is 5 km whereas that of the continental is around 30 km. The continental crust is thicker in the areas of major mountain systems. Which one of the above sources are indirect source of information about the Interior of the Earth? The most easily available solid earth material is surface rock or the rocks we get from mining areas. Volcanic eruption forms another source of obtaining direct information. As and when the molten material (magma) is thrown onto the surface of the earth, during volcanic eruption it becomes available for laboratory analysis. Analysis of properties of matter indirectly provides information about the interior. Another source of information is the meteors that at times reach the earth. The material and the structure observed in the meteors are similar to that of the earth. They are solid bodies developed out of materials same as, or similar to, our planet. The other indirect sources include gravitation, magnetic field, and seismic activity. Q7. Which of the following statement is the most appropriate reason of earthquake waves developing a shadow zone? a) Composition of material in the shadow zone is impermeable. b) The body waves (p and s waves) follow the Snell’s law when they pass from one medium to another and hence deflect from the path. c) Secondary waves do not pass through liquid medium (outer core). d) Both (b) and (c). The layering of Earth has been inferred indirectly using the time of travel of refracted and reflected seismic waves created by earthquakes. The changes in seismic velocity between different layers causes refraction owing to Snell's law, like light bending as it passes through a prism. Secondary waves (S-waves) are shear waves that are transverse in nature. 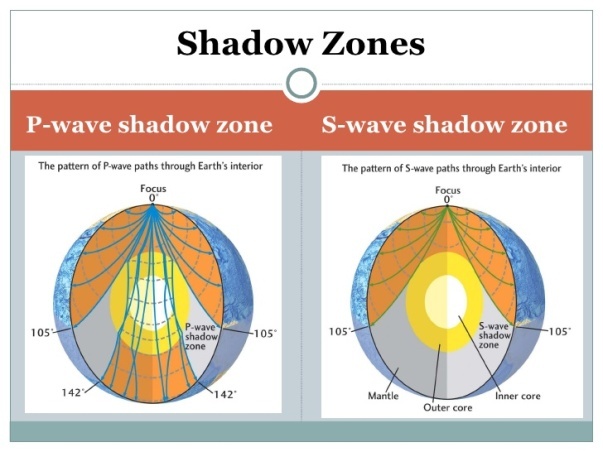 S-waves can travel only through solids, as fluids (liquids and gases) do not support shear stresses .S wave shadow zone form the boundary of outer core as it is in liquid state. Q8. Which of the following are correctly matched? 1. Lithosphere - the crust and the uppermost part of the mantle. 2. Shadow zone - the upper portion of the mantle. The portion of the interior beyond the crust is called the mantle. The upper portion of the mantle is called asthenosphere. The word astheno means weak. It is the main source of magma that finds its way to the surface during volcanic eruptions. It has a density higher than the crusts. The crust and the uppermost part of the mantle are called lithosphere. Its thickness ranges from 10-200 km. Earthquake waves get recorded in seismographs located at far off locations. However, there exist some specific areas where the waves are not reported. Such a zone is called the ‘shadow zone’. a) Both P and S can only travel in solid and gas mediums. b) P waves speed is highest in solid medium. c) S wave shadow zone form the boundary of outer core as it is in liquid state. Primary waves (P-waves) are compressional waves that are longitudinal in nature. P waves are pressure waves that travel faster than other waves through the earth to arrive at seismograph .These waves can travel through any type of material, including fluids, and can travel at nearly twice the speed of S waves. Q10. Magnetic materials in the crustal portion provide information about the distribution of materials in the interior of earth. Which of the following statements is true regarding the earth’s magnetic field? a) Earth has a dipole magnetic field that deflects solar wind. b) Flow in the liquid iron outer core creates a magnetic field. c) Solar wind contains electromagnetic particles that are deflected by earth’s field. These particles distort the shape of earth’s magnetic field in space. Earth’s magnetic field extends from the interior to out into space, where it meets the solar wind, a stream of charged particles emanating from the Sun. The field of a magnetic dipole currently tilted at an angle of about 10 degrees with respect to Earth's rotational axis. Earth's magnetic field changes over time because it is generated by a geodynamo (in Earth's case, the motion of molten iron alloys in its outer core).While the North and South magnetic poles are usually located near the geographic poles, they can wander widely over geological time scales. However, at irregular intervals, the Earth's field reverses and the North and South Magnetic Poles relatively abruptly switch places. These reversals of the geomagnetic poles leave a record in rocks that are of value to paleomagnetists in calculating geomagnetic field’s .Such information in turn is helpful in studying the motions of continents and ocean floors.